Happy National Dog Day. But every day is dog day here, us dog lovers spoil our dogs all the time. 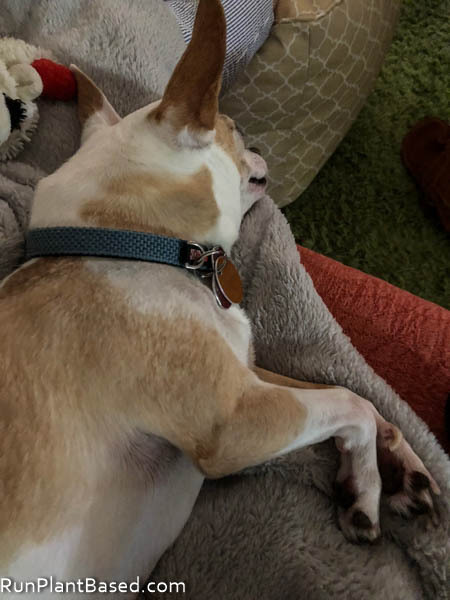 Miko got many long walks this weekend and couch cuddle time. 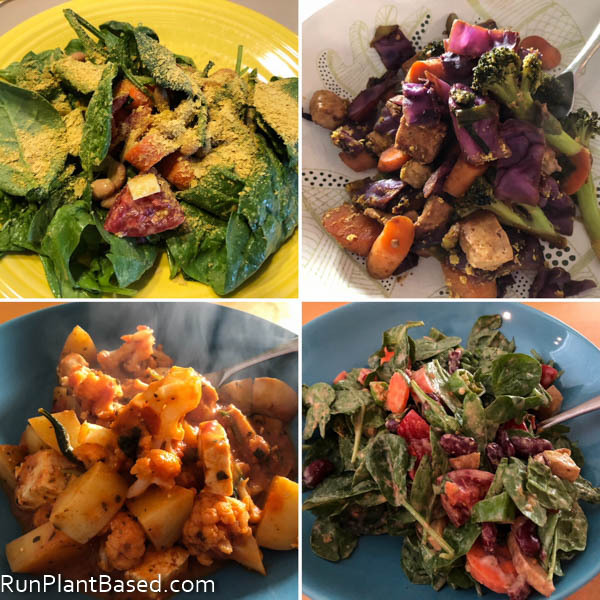 It’s been an interesting week of simple eats that included salads with beans and hummus dressing, oil free veggie tofu stir fries, and simple marinara sautes that I seem to be obsessed with lately. Get a decent, vegan friendly jar of pasta sauce and simmer chopped potatoes, veggies, beans, tofu, etc. in it for a simple meal. Maybe jazz up with a splash of red wine, garlic, etc. and yum! I’ve been a fan of the Sprouts brand organic pasta sauces lately for the flavor and price. 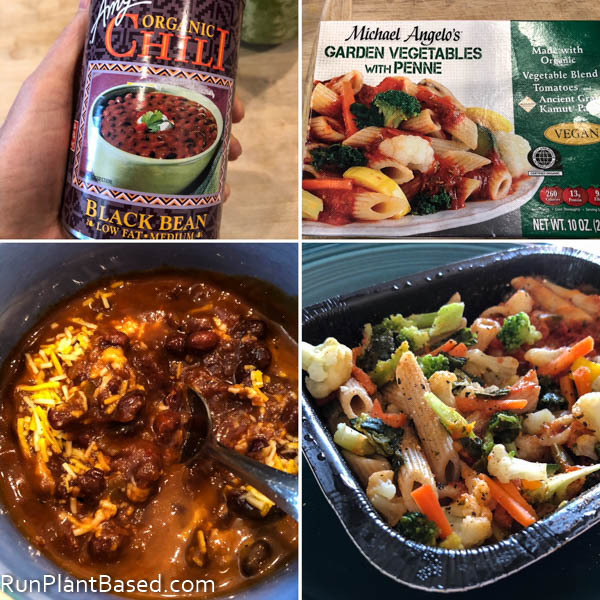 We’ve also been enjoying some other finds this week including Amy’s Organic Black Bean Chili and Michael Angelo’s Garden Veggies with Penne for simple workday lunches. The chili was excellent with So Delicious Vegan Pepperjack Shreds and the simple pasta dish had a hearty amount of veggies and flavor. 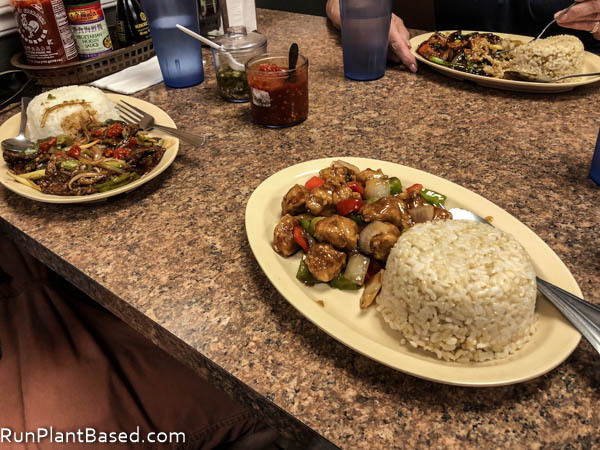 We also stepped out to Pho Vegan Asian Cuisine for a great lunch of spicy vegan “beef” and vegan orange “chicken”. Friday night I had intended to try a new place in Midtown Sacramento for dinner, but we ended up at Veg Cafe when we got frustrated looking for parking and that was a good thing! 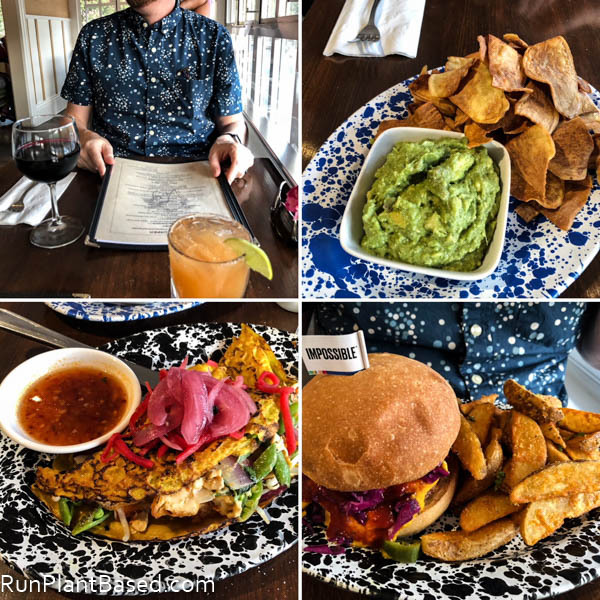 We started with drinks and the sweet potato chips with guacamole. I got the colorful and delicious tofu crepe while hubby went for the crazy good western Impossible Burger with vegan cheese. Today the weather was a little cooler and sunny, so we met up with my sister and family to kayak on Lake Natoma and this time of year is perfect for renting with kids back in school and cooler temps. We had no lines or wait and opens waters to explore. I was tempted to rent a paddle board, but decided not to because the water was a little choppy and I’m not that experienced on them yet. No pictures because we decided to not risk dumping phones into the water, but we headed to Fair Oaks after for a late lunch at Sunflower Drive In. 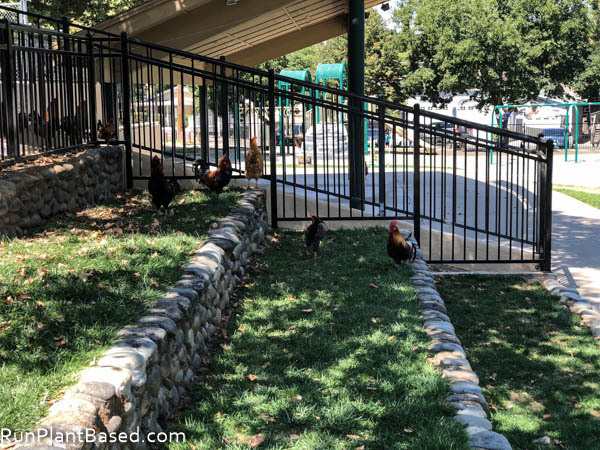 Fair Oaks is such a fun area to visit with chickens roaming freely everywhere. 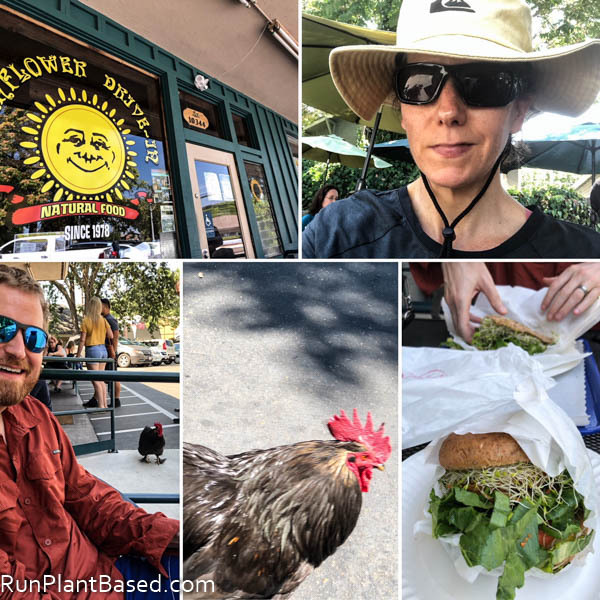 And Sunflower was the perfect choice with outdoor seating since we were covered in sunblock and probably not smelling great, lol. It’s a fun vegetarian/vegan place with many great options. I got the vegan millet burger and the supreme nut burger for hubby. There was live music and chickens roaming around the tables, such a fun lunch. It was nice getting a little outdoor time, maybe we’ll try renting paddle boards next weekend. And the burgers were delicious as more traditional veggie burgers not trying to be meat, I really liked the millet texture of mine and that it was packed with so many greens and sprouts. 7 ways to improve distance running. 7 homemade vegan waffle recipes. If America went vegan, more people could eat. Get your protein from plants. This vegan’s life makes me jealous. How to eat a healthy vegan diet. That cafe with the chickens roaming around looks great! I love chickens. Haha, I didn’t either until later. Me too and they’re so friendly there, not bothered by people at all. LOVE hearing about your outings and eats! Neat pics of the places you visited!!! Thanks and same for you!